We are officially in fall!!! Which only means tons of weddings, engagement sessions, and more! 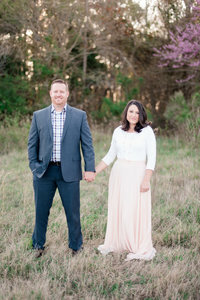 When it was time for Danny & Emily’s session just a week ago, we were still in high 80’s weather! Yet, these two were persistent in channeling the fall vibes and they were absolutely adorable. I mean just look at Emily’s outfits that she chose for her Williamsburg engagement photos! What a fashionista! Williamsburg is quickly becoming more and more a place that we love. We are going on 15 years here in the Hampton Roads area of Virginia. We keep talking about possibly moving closer to the family. However, each year that passes, our roots get deeper. We are in Williamsburg probably 3-4 times a week if not more and each time we drive into the city, it feels like home. I also find myself saying more and more that we are going to move to Williamsburg one of these days. I am not sure what the future holds for us but we will continue shooting and discovering more and more of this beautiful city that we love. Emily and Danny an amazing friendship and chemistry. These two were such natural in front of the cameras. Being William and Mary alumni, the campus and Colonial Williamsburg were the perfect locations for their engagement shoot. We began our session in the historic area in some pretty gardens we found. So much laughter and sweet moments were shared. Even a cute little sheep got in on the action with a little love! Before the engagement session, our couples each fill out a questionnaire that helps us get to know them before the big day. We love reading through these and getting a feel for what’s to come. One of the questions we ask is “ What do you admire most about your fiancé?” These two had such sweet answers that I had to share. He’s SO unbelievably kind, patient, and giving of his time. He’d do anything for his family. He’s extremely ambitious but still humble and has such a natural knack for leadership that is very comforting to everyone he’s around. He’s very confident and self-assured, in a calm, reassuring way that I think is so unusual in people our age. And one of my absolute favorite things about him is he is very optimistic. From Danny: ( A man of few words but still very sweet). How hardworking she is even in the face of adversity, while also maintaining her ability to be kind and caring. Danny & Emily, You two are seriously such an awesome couple. We had such a great time getting to know you both and despite the sore loss of Danny’s baseball team during the session, he was still such a great sport! Luke and I are looking forward to your wedding next year in Williamsburg at the Williamsburg Inn! It is going to be amazing but even more, you guys are going to be incredible together as husband and wife. See some of our favorites from this fall engagement session. I love these outfits. But even more, I love Emily’s red hair! Such a sweet moment. These two really know how to snuggle! Okay, don’t these two need to be in a magazine??? And let’s just drool a little bit over this light. Give me all that golden light every day! Thank you to William and Mary student who unknowingly let us use their bike as a prop! Ending our fall engagement photos with ice cream is always a win! More Williamsburg Va engagement sessions below! Are you a bride to be getting married in Williamsburg Va? Would you like to hear more about us and our process? If so, we would love to hear from you! Visit our contact page and let us know all those details and we will be sure to respond quickly!